During your stay at the Sayre Mansion, you may want to venture out and take in one of the area’s greatest natural wonders. A visit to Bushkill Falls PA is a great day trip option for nature lovers. 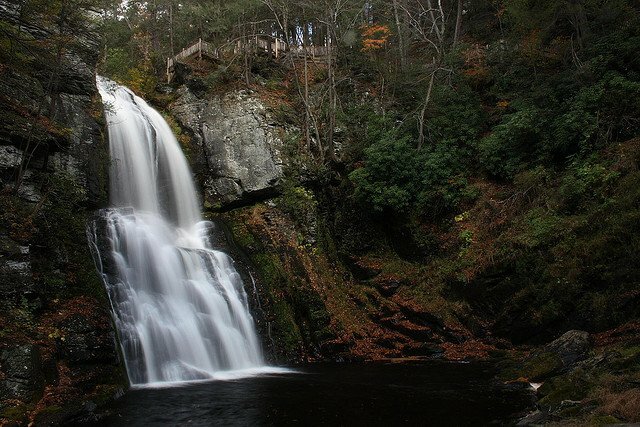 Located about an hour from Bethlehem, Bushkill Falls PA has great places to hike, birdwatch, fish, and explore. This breathtaking series of waterfalls in the Pocono Mountains of Pennsylvania is a must-see during your time in the Lehigh Valley. Here are some reasons to visit Bushkill Falls PA this summer. Bushkill Falls PA is often referred to as the “Niagra of Pennsylvania” due to their majestic quality. Visitors have been marveling at the falls since 1904, when Charles E. Peters opened the land to the public. The falls begin at the headwaters of Bushkill Creek and flow down the mountain towards the Delaware River. Bushkill Falls PA is a collection of several falls rather than a single waterfall, although the main waterfall is actually named Bushkill Falls. There are five falls with names and three smaller falls that are nameless. The main falls tumble over a 100-foot cliff into a deep pool below which is rich in local flora. Other falls include Bridal Veil Falls, Bridesmaid Falls, Laurel Glen Falls, and Pennell Falls among others. A great way to discover the scenic beauty of Bushkill Falls PA is to take one of several hiking trails through the wooded Pocono Mountains. There are four trails of varying lengths and difficulties. The Green Trail provides a 15 minute walk from the observation deck of the main falls with no climbing involved. The Yellow Trail is a 45 minute hike that hits the Main Falls as well as Lower Gorge Falls, Laurel Glen, and Upper Canyon. The Blue Trail is a longer hike of one hour and fifteen minutes that has scenic vies of Pennell falls. The longest and most difficult trail is the Red trail which takes more than two hours to complete. Only experienced hikers are encouraged to take on the Red Trail, which has views of Bridal Veil Falls. Along the trails you will find ample opportunity for bird and wildlife watching. Local and migratory birds you may see include ducks, geese, songbirds, hawks, owls and eagles. Other animal species in the woods surrounding Bushkill Falls PA include black bear, white-tail deer, bobcat, foxes, rabbit squirrels and more. There is a Pennsylvania Wildlife Exhibit at the entrance of Bushkill Falls PA with informative displays on the local wildlife. 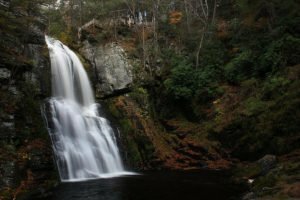 Other recreational opportunities at Bushkill Falls PA include taking a paddle boat out on the water, fishing or playing a round of miniature golf as well as “gemstone mining” with a functioning sluice. When planning your day trip to Bushkill Falls PA, don’t forget to book your stay at the Sayre Mansion. After a day on the trails, our Bethlehem bed and breakfast is the perfect place to put your feet up and recount your adventures. And after the solitude of the wooded hill surrounding Bushkill Falls, our location in the heart of Downtown Bethlehem will provide you with plenty of shopping, dining and entertainment options. Pick out one of our elegant and comfortable rooms or suites and start planning your getaway today!